Laugh all you want, but my mother still loves her Snuggie, and her continued enjoyment of this fine as-seen-on-TV product has piqued my curiosity about their other offerings, so today I’m going to regale you with yet another item I picked up in a US pharmacy that prompted an intrigued “hrrrmmmmmnn”. The contraption: Sunglasses. 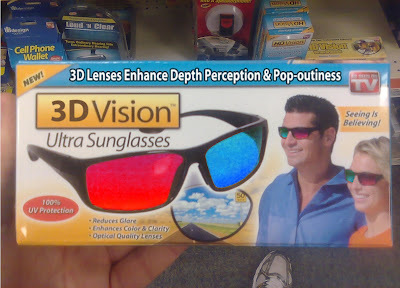 Sunglasses that apparently offer ‘clarity that you have never experienced’, ‘enhance your vision’, act ‘just like High Definition TV’, while being ‘lightweight and durable’ and offering a ‘Modern European Style.’ Sounds too good to be true! The pitch: You’ve heard of high-definition television, right? It’s new and cutting edge, just like you want to be. Sadly, your new television is outputting images at 720p, but your old-fogey eyes are only capable of handling 480i. 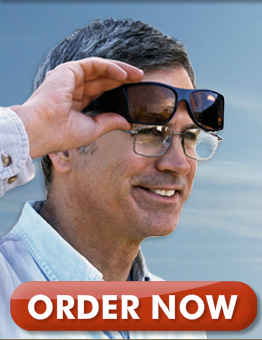 Wouldn’t it be great if you could wear something on your face that would make your eyes capable of high-definition? Instead of doing crazy sci-fi stuff involving bending light and focusing images for your retina, how about you wear a pair of sunglasses with an amber hue? This way, when you go outside wearing sunglasses, it won’t seem as dark! It’s high definition! The target market: Impressionable cretins with such a fundamental misunderstanding of what ‘High-Definition’ means that they will pay $20 for a crap pair of shades off the telly-box. As seen on TV. Which makes it good, right?